HAVING BARELY SCRAPED THE FROSTED SURFACE, YOUR BREAKFAST WARRIOR AND HIS INSATIABLE APPETITE RETURNS! THIS… IS POP-TART QUEST! Deep in the heart of the Amazonian wilderness, entrenched so far into the darkest rain forests that society is less than a distant rumor, there lives many creatures that few mortal men have ever seen. These animals know not natural light nor vehicles nor the Internet nor plumbing. They live as their god intended. Free. Wild. Wildlicious, even. 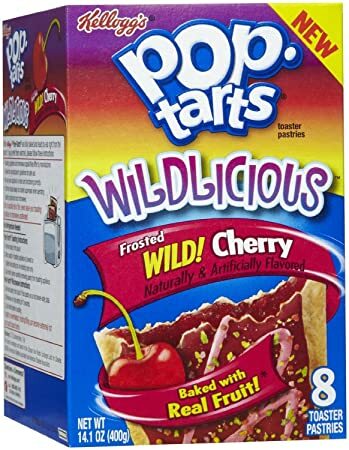 So, too, live these Pop-Tarts, Wildlicious Cherry. These primitive pastries were snared only by the most cunning of Kellogg’s employees. It was feared, they say, that when these men and women were sent into the world’s shadowy nooks, no one was sure they would ever return. But return they did! But do they know what they’ve unleashed on mankind’s unsuspecting palettes? Can they possibly comprehend what their meddling has brought? The first thing you will notice about Wildlicious Cherry is their feral nature. The howls that emanate from their foil wrapping are surely meant to frighten off the less hardy of Pop-Tart aficionados. These Pop-Tarts do not want to be consumed, and they fight viciously when first confronted by pampered citizens in our fancy homes and with our luxurious dinnerware. Through great effort and force of will and owning of a toaster, however, these wild tarts can be tamed. And with tameness comes a delightful breakfast treat. So yeah, Wildlicious Cherry. These aren’t bad. They are a bit more, erm, tart than regular cherry; I was expecting this to just be a basic cherry Pop-Tart, but with more colors of sprinkles (this is what my brain is telling me, however, I have not had a regular cherry Pop-Tart in years. I could well be getting fooled by the part of my brain where I keep historical Pop-Tart context). I think out of all the fruit flavored Pop-Tarts I’ve had in my life… these are definitely Top 3. Also! Top 3 of all the Tarts I have tried in this journey! B+ : As far as fruit-flavored P-T’s go, these are the cat’s pajamas. A+ : Yes, all of them! Why my CHERRY Pop-Tart has green and yellow and orange sprinkles, I’ll never know, but this Pop-Tart is bustling with the energy of a rainbow. A+ : Just the absolute stupidest. 40%? This was hard to gauge because I definitely toasted the toasted one for too long. But it still wasn’t bad, so it’s got that going for it! The Untoasted one retained its tartness better for some reason, and I REALLY hate that I keep referring to Pop-Tarts as tart. Ugh. I hope next week I find a poppy one! C- : It was good–definitely tasted better than Chocolate Poopberry from last week–but I really can’t get past that name. “Wildlicious”. Come on. That’s not even a word.